Cooking is not something I enjoy. I’d much rather have someone else prepare the food. But that’s not a budget-friendly option. After a day at the office I don’t have the time energy to make a meal from scratch. With these 10 items in my kitchen pantry it’s easy to pull together a nutritious, inexpensive meal. Granted, they’re better with some perishables but that’s a topic for another day. 1. Canned Beans. Sometimes called nature’s perfect food, beans are low-fat and full of fiber and protein. I stock up on cans of organic black, pinto, great northern, red and even refried beans when they’re on sale. Store brands are fine, just check the added sodium. 2. Dried Onions. Onions would go bad before we use them so I use dried or frozen. The fact is, I wouldn’t cut them anyway as I can’t stand the tears and redness in my eyes. You can use dried onions for any recipe where there’s moisture to rehydrate them. Also buy dried peppers for use in the winter. 3. Canned Tomatoes. 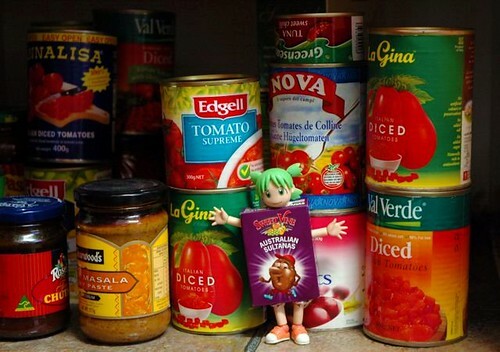 My cupboard includes three types of canned tomato products. I use tomato sauce the most in various pastas, casseroles and more. The next two are diced tomatoes with one difference. In addition to plain, we stock tomatoes with chilies for dishes that need an extra kick. 4. Pasta. While whole wheat pasta is healthier, I can’t get my family to eat it so we mostly buy brown rice pasta. Stock different types to add variety to your food and based on recipe needs. My pantry includes spaghetti, rotini, elbow and penne. 5. Rice. Many quick meals will include rice either in the dish or as a base. We stock both brown and white rice. Cooking rice is easy, it’s cheap and filling. 6. Spices. Use spices instead of fat to add flavor to your food. My favorites include garlic powder, chili powder, red pepper, cinnamon and taco seasoning. Several of my go-to recipes include taco seasoning as it’s a zesty mix of spices. Look for low-sodium to try to cut down on salt intake. 7. Cooking Soups. Many casserole recipes call for a can of some kind of cream soup. The varieties I buy are: cream of chicken, cream of celery, cream of mushroom and cheddar cheese. These can be pricey so buy the store brand or stock up on sale. A local grocery store recently had cooking soups on sale for 88 cents each. 8. Canned Meat or Fish. Keep canned chicken and tuna on hand for a protein to add to recipes. We don’t eat spam or chipped beef, but my mom cooked with them both when I was a kid. This is the most expensive item on the list so buy it on sale or at your warehouse club for better prices. 9. Broth. I buy chicken broth by the case at the warehouse store but also stock beef and vegetable broth in the pantry. This is a core ingredient for many of the soups I make. You can also use it to saute food for a low fat option. 10. Vegetables. Canned vegetables are not my preference but a good backup to fresh or frozen. I also use them in casseroles and skillet meals. Keeping these essentials on hand makes it easy to pull together a meal without advance planning. Are your essential pantry items on the list? What would you add? To be sure not to miss any Bucksome Boomer updates subscribe via RSS reader or by Email. This sounds just like my pantry! You covered everything, great list! Mentally, I can’t get over canned chicken. Yes, I buy tunafish but canned chicken just weirds me out for some reason. I think canned chicken is okay for casseroles or multi-ingredient dishes, but I’m not a big user of it either. My wife and I always add black beans to our pantry. We eat a lot of mexican food, so we have a lot black beans. Thanks for the post! Brucebucks, It was nice meeting you last weekend and welcome to the PF blog world. My first husband was from Cuba where the bean of choice is black. You used to never see them at restaurants but now I think they’re more commonplace. Also try to have potatoes handy. Do they count as a pantry item? I went back and forth over potatoes. I think you could list them; they just don’t last as long as the others. Whoops, I actually meant “jars” of pasta sauce. We usually go with Classico, which I always seem to have coupons for. Jolyn, I have pasta sauce usually in there as well. We like the Ragu Chunky and get it on sale for $1 a jar with a coupon. I would use the mushrooms if I could get others in the house to buy it. I will have to buy a jar of pimento; forget to use that ingredient! I do something similar. Well, BF does. We stock up on staples (whole canned tomatoes for pastes and so on, rice, pasta and condiments) and we just shop every week for the food we need. Luckily, he likes to cook and we have a dishwasher so I’m not stuck doing it. Win win. We have very similar pantries! When I think of some of our staples, I would add salsa and refried beans too. Kris, I try to keep both of these in my pantry as well. Thanks for reminding me. Sounds like my pantry. I noticed these items mostly focus on lunch/dinner meals, but I like to also stock oatmeal for breakfast. It lasts for a very long time and it’s something I can actually make! Little House, good point about the oatmeal. I do stock that and even use it in dinner recipes (meat loaf). Ooh, you should post your freezer staples next. Most of my meals are a combo of something out of my freezer, something out of the pantry, and something fresh. Forgot to add. My staple list looks very similar except I don’t think I could function without PB+J. It’s a great emergency meal…even if it’s not the healthiest of options. This a great addition to the list. My husband has peanut butter and crackers as a snack often. Sandy, I will definitely be following up with essentials in the freezer and refridgerator. This is a great list to make an emergency meal instead of going out to eat! This can really help to save money and stop unhealthy habits! I was inspired Sunday when it was 5 pm a nd we had no idea what to eat for dinner. I used pasta, tuna and a can of cream soup to pull together tuna noodle casserole. It was inexpensive, fast, and delicious! This was a fun article! I know you listed dried onions and cooking soups, Kay Lynn. I always make sure I have onion soup mix in my pantry. It is extremely versatile, used in tons of recipes, and it can often make ordinary meals extraordinary! Len, that’s a great addition to the list. I have many recipes that call for this ingredient as well. It’s great for adding flavor to what might be an otherwise “okay” dish. Great post. It will be very helpful for people who are trying to eat better as well as stock up in case of sickness or emergency or just needing to make a meal quick. We have all of those things in our pantry along with nuts, dried fruits, lentils, and whole grains such as kamut, wheat berries, and barley. Those are really great for quick salads or adding to soups. Miss T, I’ve never heard of kamut before. We do have barley in the pantry.